One of the awesome things about the original Gamma World is its system for deciphering the function of technological artifacts. This is a super fun part of play in both Gamma World and Metamorphosis Alpha, although I find the simple percentage chance Ward used in MA much less compelling than the flowcharts Ward & Jaquet provide for GW (and Gygax picks up for the Barrier Peaks AD&D module). Although the coolness of all these boxes, arrows, and skull and crossbones is self-evident, the first time I used it in play was underwhelming. I love the mini-games within old-school RPGs, but this one is akin to Candyland in its total lack of choice; you’re simply rolling a series of dice with no guidance as to what each die roll means, until eventually you either master the controls of the Ronco Inside-The-Shell Electric Egg Scrambler or accidentally detonate its nuclear power plant. Candyland is well designed as a boardgame for families with young children because of its competitive aspect. Its reliance on pure chance instead of choice means all players are equally matched, preventing more-skilled players from having to choose whether to handicap themselves and let the kids win, and thus teaching the important lesson that victory and defeat are fun parts of the game for everyone. But the competitive aspect of the Gamma World charts is erratic at best. I didn’t know until reading this pleasingly advanced-math-heavy essay at the Acaeum that you were only allowed to make five rolls on the artifact chart per hour, and I think there’d be a limit on the number of times I could GM-engineer a situation where the players were racing against time to decipher an artifact before something excitingly bad happened. The first time I used the artifact charts, I laid them out in full view of the players, placed a marker on their starting square, and asked them to roll to see where they went. As their marker traveled to different squares, I’d try to provide some description of what was happening and have them tell me what they were doing to make the next roll, but it wasn’t very convincing; the players could see that it was all just a big abstract mechanistic flowchart, not a complex situation in which their decisions & my responses mattered. Also, no one in this original group had a PC with an Intelligence score or a mutation that would make figuring it out more likely, so there was a lot of going around in circles: 7, you go nowhere; 9, you’re back where you started. This repetition tended to make a further mockery of my descriptions and attempts to make it seem like the PCs had choices. Here’s what I did in the most recent session of the New York Red Box’s Gamma Jersey campaign that I thought was much more successful in making the process of deciphering a complex artifact (a MAGLEV train) fun and immersive. So then I wrote upper panel and lower panel on a wipe-erase board. “Go ahead and roll a d10, modified by your Intelligence and mutations.” The result was a 3, so I wrote this next to an arrow leading off of the upper panel. “You find that the upper panel lights up for just a second when you touch it, and then goes dark again.” I wrote this at the end of the arrow from the upper panel. “It doesn’t do anything on its own, but eventually you figure out that if you’re already touching the upper panel, the lower panel will light up too.” I draw an arrow from the panel to the result of this action, along with the artifact deciphering score – both to show the players that this was the result of a pretty good roll, not a botch, and to help me reconstruct where they were on my Chart C in case my marker got knocked off or something. “Cool, I’ll try those.” (Resulting roll is a 1). 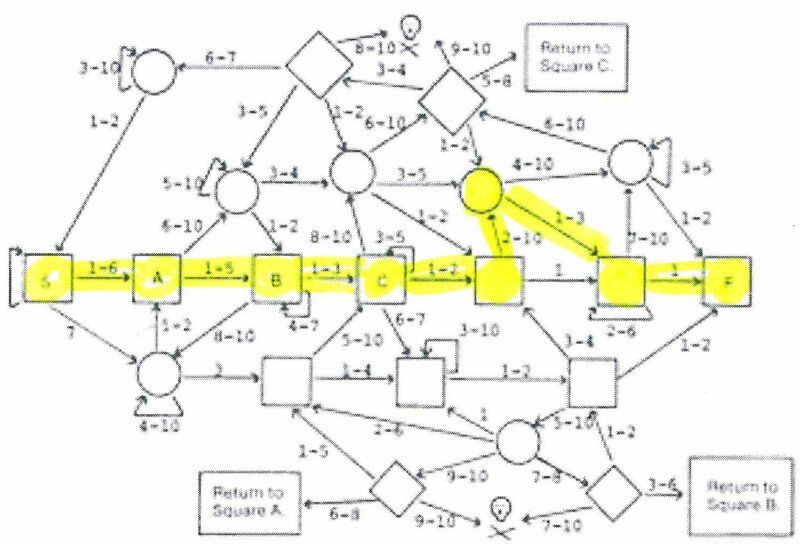 Their progress through the Chart C flowchart (shown in yellow) was remarkably direct – these are some smart mutants. I think that making this version visible to the players, as I did in my first Gamma World game as an adult, would have been a lot less interesting than the narrative chart I drew for them in my second. It was purely improvised; all I did to get started was to think about what a few possible ways of interacting with a futuristic train might be. 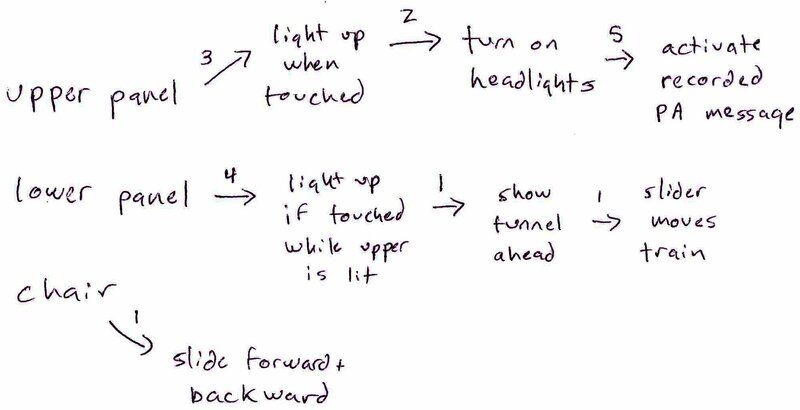 It was concrete; the players experienced it as a set of things their characters could interact with, and being able to visualize what they were doing was invaluable in improvising a narrative description of their progress through the abstract flowchart. It had unexpected consequences; the flowchart basically boils down to success or failure, but the way we visualized the situation allowed for lots of other meaningful intermediate results. Activating the train’s recorded public announcement might have attracted a wandering monster, for example, and at one point they were worried that causing the train car doors might sever a limb of the seven-meter-tall mutants they had stuffed back there (as did happen earlier in the session with a less-forgiving shaft access door). It was open to player creativity, as in the case of the seat controls. In an artifact with a less defined use, the decisions the players make as they interact with it might cause them to figure out a use that’s quite different than the one you had in mind: you think it’s a bicycle whose tires have crumbled away, but as they’re asking “can we slot a rope along the front rotating disk?” the results of their successful artifact use rolls might mean they wind up deciding it’s a spinning wheel or a pedal-driven winch. Any character, or group of characters, may attempt to grapple and subdue an opponent. This is accomplished by having the attacking character, or characters, roll a normal “to hit” roll against the target. The hit dice of all attackers who successfully hit the target is totaled, and a number of d6 equal to this total is rolled. The target must then roll a number of d6 equal to his own hit dice. If the attackers’ roll is greater than that of the defender, the target is considered pinned and may be disarmed, shackled, bound, knocked-out, or otherwise subdued. If the defender’s roll prevails, he has thrown off all of his attackers and they must spend one combat round recovering as if from a fumble. If the dice are tied, they are struggling, with the defender still on his feet, and another set of grappling rolls will be made on the next round. Any additional attackers who score a hit may add their dice to the roll. My problem with this is that requiring a to-hit roll to start a grapple doesn’t make sense for my understandings of what armor class means. Wearing a lot of metal strapped to your body doesn’t make it harder for someone to get an arm bar on you. I don’t use Dex modifiers to AC (they give a saving throw vs. damage instead, and I don’t want to introduce that extra step of die rolling into this grappling procedure), and although “touch AC” seems like a reasonable idea and one which you can extract from various texts in AD&D pretty directly, I have seen the madness to which this leads. I think that the rightful place of armor in a grapple is that, if you have lots of metal strapped to your own body, you don’t have to worry as much about getting cut while you’re trying to move inside your enemy’s reach and take away his sword. And, in a game where combatants are normally assumed to be able to deal potentially lethal blows at more than arm’s length, it seems to me that starting a grapple is better expressed as whether your foe can use his weapon to drive you back, not whether you can grab them. Any combatant, or group of combatants, may attempt to grapple and subdue an opponent. This is accomplished by having the defender roll a normal “to hit” roll against each of the attacking grapplers. The hit dice of all attackers who were not hit by the defender is totaled, and a number of d6 equal to this total is rolled. The target must then roll a number of d6 equal to his own hit dice. Strength bonuses or penalties, if any, are added to each d6 roll. If the attackers’ total is greater than that of the defender, the target is considered pinned and may be disarmed, shackled, bound, knocked-out, or otherwise subdued. If the defender’s total prevails, he throws off the grapple attempt and may roll damage against one of the attackers who were hit by his attack rolls in the initial step (or more than one, if he has the ability to damage multiple opponents in a normal round of attacks). 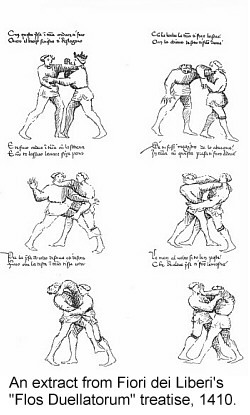 If the attacker’s and defender’s dice are tied, they are struggling, with the defender still on his feet but unable to make normal melee attacks; another set of grappling rolls will be made on the next round, in which the defender does not have the ability to make to-hit rolls to prevent attackers from adding their hit dice to the grapple pool. The consequence of failing a grapple here is that the defender gets to score a hit with his weapon (or more than one, if he has multiple attacks) on you as he throws you back. I like this better than the idea of being stunned for a round, which doesn’t have much precedent otherwise (can you throw someone to stun them in other situations?) and is hard to make sense of if a round subsumes many different events, esp. a minute-long round. If you succeed on the grapple, some of your allies may be held at bay by the defender’s weapon, but you manage to grab him before he can follow up on these feints and threats and make them actually damaging. – Armor of the Hero: Chainmail & Shield — AC 4. Orc #1 – 06; #2 – 10; #3 – 18; #4 – 20; #5 – 03. Two of the Orcs have grappled the Hero, and if his score with 4 dice is less than their score with 2 dice (one each) he has been pinned helplessly. If it is a tie they are struggling, with the Hero still on his feet, but he will be unable to defend himself with his weapon. If the Hero scores higher than the Orcs use the positive difference to throw off his attackers, i.e. the Hero scores 15 and the Orcs scored but 8, so the Hero has tossed both aside, stunning them for 7 turns between them. This is an awesome time to be in and around New York if you’re interested in the intersection of roleplaying games and the art world. If you’re not interested in this it’s because you didn’t know it existed; I dare you to check out the parts of that interesection that are coming into local galleries and find it un-interesting. Happening right now is Mat Brinkman’s show PHANTASMAGORIA at the Hole, 104 Greene St., until Oct. 23rd. The exhibition press release promises “an advance previewing of selected work by various artists from a yet to be released Necro~Demonic Dungeon~Crawl~Warfare Boardgame. What will this be like? We don’t know.” I suspect, however, that the number of people who go to art galleries & know what a dungeon crawl is like is both large and growing. All I knew about Mat Brinkman– before today– was the comics I had seen in Kramer’s Ergot. I didn’t know if his dungeon-y imagery was hipster-retro-slumming, or heartfelt. After today’s rush to hang the art & the subsequent arrival of the crowd– we had time to converse, and I am pleased to report that the artists are genuine gaming-friends. Of the game topics we discussed, my favorite moment was when one of the collaborators mentioned “Rifts”. Now there’s something that would blow the art world’s mind. Opening tomorrow from 6-8 pm is Zak Smith‘s A Show About Nothing, at Fredericks & Freiser, 536 West 24th Street. It runs until Nov. 6, 2010.
pieces is a drawing of big dungeon. Opening October 22nd from 6-9 pm is Doomslangers: A Project by Casey Jex Smith, at Allegra LaViola on 179 E. Broadway until December 3rd. The exhibition includes drawing, painting, installation, performance, video and sculpture all related to the group Doomslangers, and their Dungeons and Dragons adventure to protect the city of Dingershare, root out evil, and make sure the Silver Noni Fruit does not fall into the hands of Lord Ricaek. Dungeons & Dragons is a tabletop role-playing game that allows players to immerse a created character into a fantasy world of fighting, magic and adventure. A Dungeon Master moderates the player experience and creates the story line to which the players react to using dice rolls, statistics and structured yet free-form system of play that is derived from miniature war games. The original game was published in 1974 and created by Gary Gygax and Dave Arneson. Over the last 5 months, these eight artists have been invited by Casey Jex Smith to play this D&D campaign from various parts of the country using videochat and in turn, make art that reacts to their experience. As the artists negotiate the day-to-day realities of an adult “responsible” life in the real world, the need for a community in which they can participate becomes stronger. The ability to communicate and play the game over the Internet frees the participants to live how, and where, they like while still offering a defined structure to create narrative, meaning, magical weapons, and monsters that hoard treasure. During the first 3 days of the exhibition, visitors to the gallery can create a free, personalized character sheet that allows them to begin playing D&D. On Wednesday, 20th October the Doomslangers will finish their 5 month long campaign in the Gallery basement. The next day, NYC resident Tavis Allison will be the Dungeon Master in a campaign that visitors can participate in. For the opening on Friday, 22nd October visitors are invited to come dressed as their favorite D&D character or monster, participate in the final battle against Lord Ricaek, drink heal and mana potions, and hear music by acclaimed bard, Lark Dreambow. Beholders are welcome. So yeah, on Thursday the 21st, I’ll be running a D&D game in the basement of an art gallery in Manhattan. 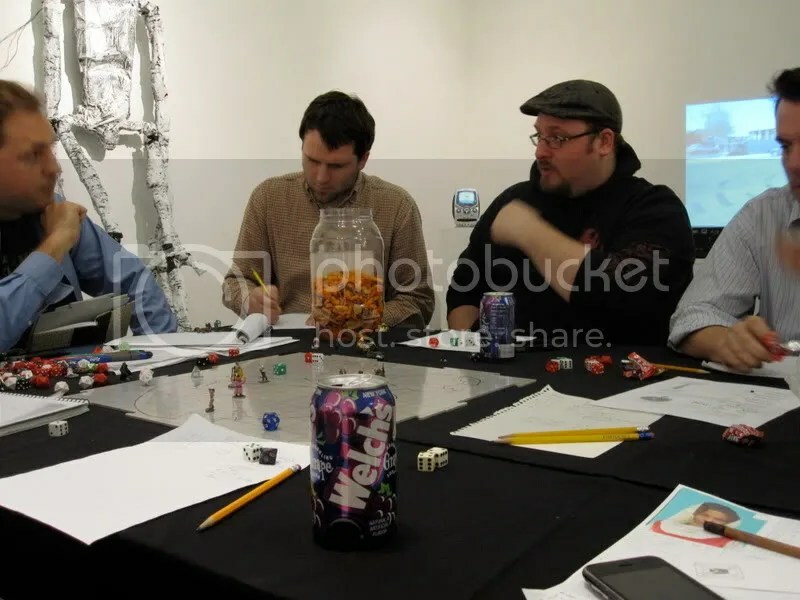 I’ll be trying out some of the ideas for how to engage players walking in from the art world with moldy or non-existent experience of RPGs that I developed from doing the D&D installment of Ryan McGinness’ 50 Parties, and drawing on my experience as a Tower of Gygax GM where handing out death ribbons and maintaining a high player flow-through rate is part of the step-right-up carnival fun. Timothy Hutchings is a gamer and visual artist who often betrays the viewers’ sympathies and trust while delving into the history of film, minimal aesthetics, and chance based conflict resolution. Ryan Browning combines elements of the traditional Romantic landscape, formal abstraction, and the simplified forms of digital representation to investigate a possible mythology where the virtual and the real are forced to evolve a new and sublime natural order. Chris Coy works with the activities and escapist strategies of the suburban (usually white and often teenage) male. Casey Jex Smith addresses personal identity in finding meaning between three seemingly disparate worlds: religion, sci-fi/fantasy and “high-art”. Art and games are both forms of ritualized human creativity. When Marcel Duchamp gave up the former to pursue the latter, he famously said “I have come to the personal conclusion that while all artists are not chess players, all chess players are artists.” The interface between art and games is especially provocative for many artists whose imaginations were shaped by the 1974 publication of Dungeons & Dragons and the uniquely free-form and collaborative genre of role-playing games that it inspired. This panel brings together studio artists and role-playing theorists to explore the ways in which making art is like and unlike playing a role within a game. I’ll post more about this, and the email discussions that led up to it, as the date draws nearer. One thing that still isn’t really decided is whether or not we really will try to have “role-playing theorists” on the panel; I just stuck that in there to justify having myself be a part of it so I could ask the questions I want to learn about without having to wait to raise my hand, and throw stuff into the mix without trying to pass it off as a question. On the one hand, I’m reading The Fantasy Roleplaying Game: A New Performance Art (courtesy of a birthday gift certificate from one of the White Sandbox players: thanks!). It’s got lots of interesting stuff that gives an actual informed perspective to the things I’ve been saying for a while now about how the part of RPGs that got commercialized are sheet music, which is ultimately frustrating because what we’re doing is a jam session. Brooks McNamara, who wrote the foreword, is a New Yorker but unfortunately a deceased one; the book also frequently cites Nicholas Fortugno, whose assignment at Parsons led some players to drop into New York Red Box. On the other hand, trying to explore this performance art perspective, which I’m just beginning to assimilate, might derail the opportunity to have a really interesting conversation with a lot of awesome visual artists who we’ll have a rare opportunity to get together on Nov. 6 and pursue the perspective that’s been brewing in our email conversation for months. Feel free to comment on that, dear reader; there’s still time to work it out. The immediate action item is Zak’s opening tomorrow night!